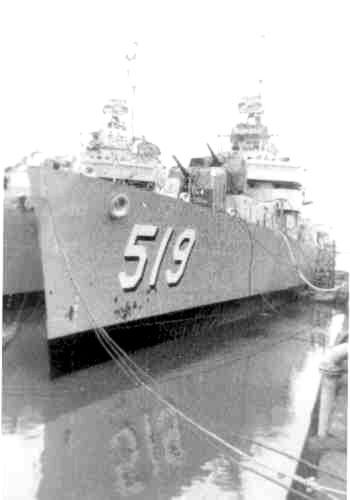 This past July 2001 marked the 50th anniversary date of the re-commissioning of the USS Daly DD519, a veteran destroyer of the WWII and Korean War eras. It was also the 48th anniversary of the Korean armistice. The significance for me is that the Daly was my first ship assignment out of the Great Lakes Naval Training Center after having enlisted early in 1951. I wanted to be a destroyer sailor from the start. It was my first choice. The experience began after arriving in Charleston, South Carolina after a full day and sleepless overnight train trip out of Chicago, Illinois. There were several hundred tired recruits on that train, eager with anticipation for a go at Navy life. 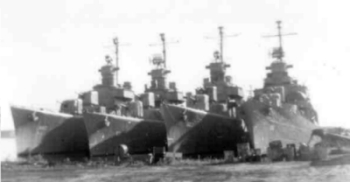 From the train station we were bused to the Charleston Naval Base and fed at the main chow hall, we were then assigned bunks aboard the Arcadia which we learned would be our “Mothership” until our assigned ship was fit for occupation. From the main deck of the Arcadia we could see all types of vessels including destroyers in varies stages of repair and restoration. It was a busy and motivating sight. The Arcadia was a rude awaking as to the “comforts” which awaited us for our future assignment aboard a “Tin Can”. 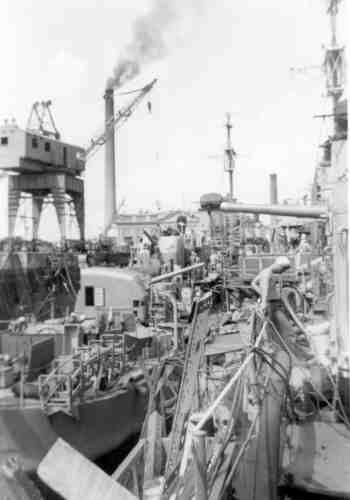 We were issued a mattress and bunk assignments 3 decks below the main deck, in a large compartment, which in all probability was laid out to be a troop carrier as well as a repair ship. There were dozens of bunks constructed of metal frames stacked 5 high. Few guys selected the top bunk, as it was necessary to climb over the other 4 to reach the top position. There were no ladders to the top. In spite of all the noise and confusion of having to live out of a sea bag, we were all exhausted and with little effort took advantage of the first sack time since our journey from boot camp. Morning reveille and muster abruptly interrupted this sack time. After breakfast we were assembled and assigned work schedules. 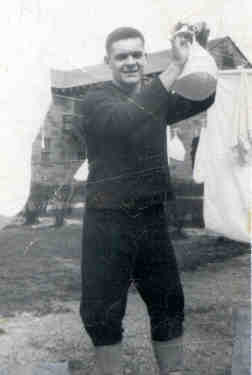 Some of the men were to work in the scullery, others in the kitchen and the rest of us thinking we were the lucky ones, were marched to the dock area where row upon row of ships were docked surrounded by all sorts of machines and equipment. It was a bustling and noisy arena where navy personnel plus all types of contractors and yardmen were already busy. That morning as we stood assembled in front of a gray hulk of steel that was only a resemblance of the ship she was going to be the reality of navy life became apparent. We were quickly divided into groups, then assigned to petty officers and leading seamen who would be our mentors for the next several weeks. Amid rubber air hoses, miles of electrical cable, sparks from welding and cutting torches, we made our way aboard what would eventually be home for 4 years. Our basic job was to clean and chip away the protective coating that covered the main deck and any steel plating that existed. Our tools were hand scrapers, whirling sanders, and deck crawlers that were air power supplied by large gasoline generators on the dock. They were noisy chattering tools that required great physical energy to hold while kneeling on the steel deck in 90 to 95 degree temperatures. It was exhausting, back breaking work with little protection from the dust say for a handkerchief over the nose and mouth with plastic goggles that were constantly clouded with sweat. One afternoon of handling the crawler was probably the most difficult job I ever had to do, it was exhausting. June 1951; A tangled mess of air hoses, electrical cable and workmen. This beastly work routine continued until it seemed everyone had a turn at that noisy crawler and the deck was clear. The sanding and priming came next as the deck and the hull of the ship became a patchwork of barn red, red lead primer. After the major work was completed, like cutting, welding and other structural refinements, the ship’s color gradually evolved. From red lead to drab gray, and deck gray, the transition of readiness began to appear. After several weeks of deck work some of us we were again divided into specialized groups and new work assignments. How I became affiliated with gunners mates is another story, but that was my next assignment; Mount 054, located on the 02 deck aft. It was another arduous job but someone had to do it. 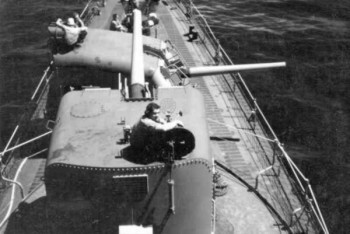 The gun was a 5”38, encased in an Electro-hydraulic powered steel turret that could readily swing about to either side of the ship and with the barrel fully elevated could fire a 54 pound projectile skyward a maximum of nine miles. Our Fletcher class destroyer had 5 such guns, 2 forward and 3 aft, plus quad 40 mm’s, 20mm’s, 10 torpedoes and 2 dozen depth charges, that could be dropped port, starboard and aft. It was a floating arsenal. My total responsibility was to have the gun in working order as well its appearance inside and out. This included an ammunition hoist area below the turret and the adjoining magazine, which was another deck below the main deck. It was a big challenge for a novice recruit. I obviously learned fast. I started out with a helper but as the day for departure for shakedown approached we learned that many of the “helpers” were reservist who were being transferred or released. 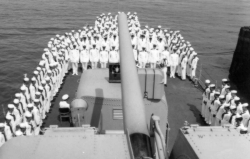 I soon found myself as sole heir to a 5-inch gun. I was appointed as gun captain. 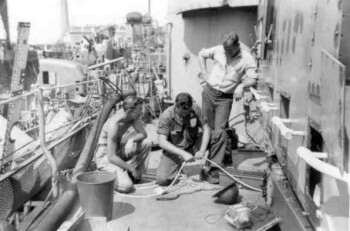 While I worked on the gunnery maintenance overhaul procedures, yard electricians installed miles of new wiring to each mount to update the link to the fire control computers, which had to be completed and tested before the ship left the dock. 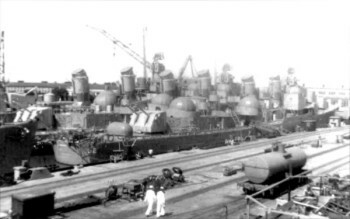 A few bugs remained that would be worked out at sea trials, however the guns were operational but would not be test fired until a final shakedown cruise which was still in the planning stages. After the re-commissioning ceremony on July 3, 1951, the ship was finally ready for her first sea trial. Our first day underway leaving the yard and heading down the Cooper River to the open sea was quite exciting. It was my first time at sea on a destroyer; it was an unforgettable experience. I knew then, that I was going to make a good sailor.